Kenziepoo loves the new Marionette collection of cushions from Darling Clementine seen above — and we love that these soft, sweet pillows are made with 100% organic cotton. Growing up Green gives us a leg up on Tightology organic kids tights which add the perfect measure of warmth and cuteness to any outfit. Prudent Baby shares a DIY swaddle blanket pattern that is sure to keep babies feeling cuddly and secure. Craftzine shows us how to make a play laptop from salvaged materials so toddlers can have their very own computer station and outsmart mom and dad in no time. Babyccino Kids raves about Inke Heiland’s wonderful wallpaper trees, which are handmade from vintage wallpapers and will turn any kid’s room into a sweet retreat. Inke Heiland’s French Oak birdhouse lamp would help brighten the space as well! 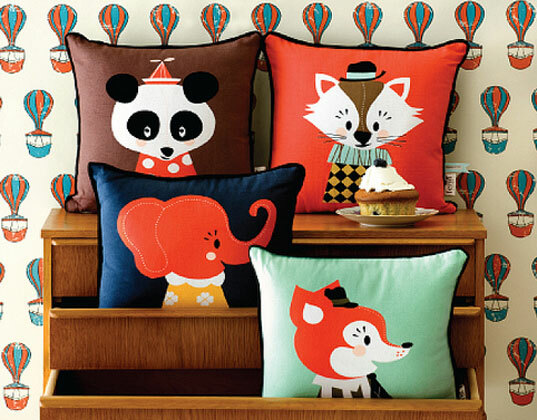 Kenziepoo loves the new Marionette collection of cushions from Darling Clementine seen above -- and we love that these soft, sweet pillows are made with 100% organic cotton.